Cyclists, make sure to check out wednesday’s roller races at the Steaming Bean! 530pm is when they begin and signups start today at noon. 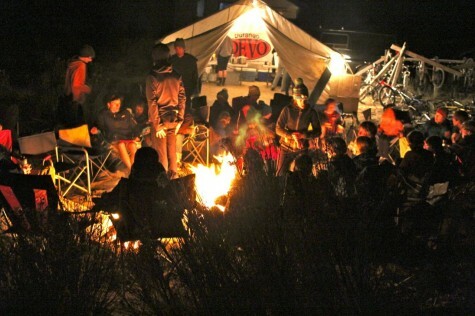 Be there, as its a legendary Snowdown event that has been running for like 20 years!Also check out Superbowl Sundays Devo gravity event at Chapman Hill. Yep on the snow is right! Chapman Snowdown Throwdown! Sunday, Feb 2nd. The main event will be a dual slalom, where racers will compete head to head in a double elimination bracket! Depending on snow conditions, A long jump competition will be held for participants to see just how far a bike can go on the snow. Lastly, a mini-slopestyle course will be built for a small competition of tricks and style. Course set-up at 9:00AM, and practice @ 10:00AM! 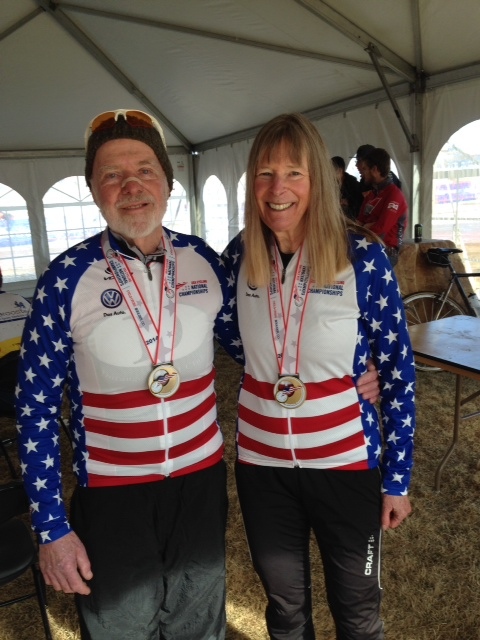 Martha Iverson and Walt Axthelm, your 2014 National Champions of Cyclocross. This bad boy sells out fast and is one of the best local mountain bike events around. Grab yourself a team and Good luck! Come on out and get your cross on. 10am for the Women, B Men and 50+. 11am for the A Men and 35+. Also make sure to check out the series party at 6pm at the Irish Embassy after the race. This documentary coming to the Animas City Theatre beginning this Friday, January 3rd, 2014 at 4:00 & 6:30pm! Happy Holidays from all of us at Durango Devo. Enjoy the family time and see you for another great season in 2014! Cyclocross race action has been moved from Aztec to Durango and race times have been moved back 1 hour to accommodate the FLC Graduation. Take note, Open women and B Men go at 11am with the A Men and 35+ers at 12pm. Its snowing outside and looks to be a great day for Cyclocross. Check out the FLC Blog for more information. 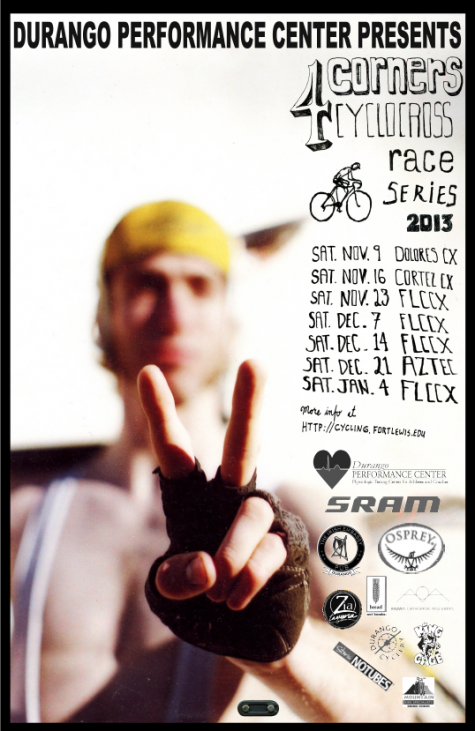 Cyclocross is on this weekend! Saturday’s race will bring later start times of 2pm for the Cat B Men, Open Women and 50+ Men and then 3pm for the A Men and 35+ Men. Also new this race will be Fort Lewis College Athletic department is helping us live stream both races on the internet, on this link, http://www.americaonesports.com/static/ftlewis.html. Local Television station IDTV will be manning the cameras and along with the live feed, they will be putting together a post event edit of the event to be show on-line and on the tube starting in January. 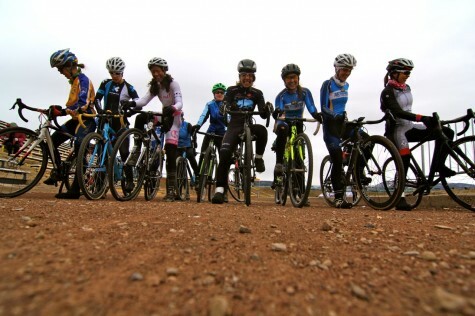 The race will be a good test for the local athletes headed to the USA Cycling Cyclocross National Championships in mid January, in Boulder, Colorado. The course is very turny and will sure to home to many a rutted out snow field. The event starts and finishes in the FLC Cyclocross Stadium and the course is very centrally located, good for spectating. Thats Coach Shafer on the poster! Poster by Coach Bailey! 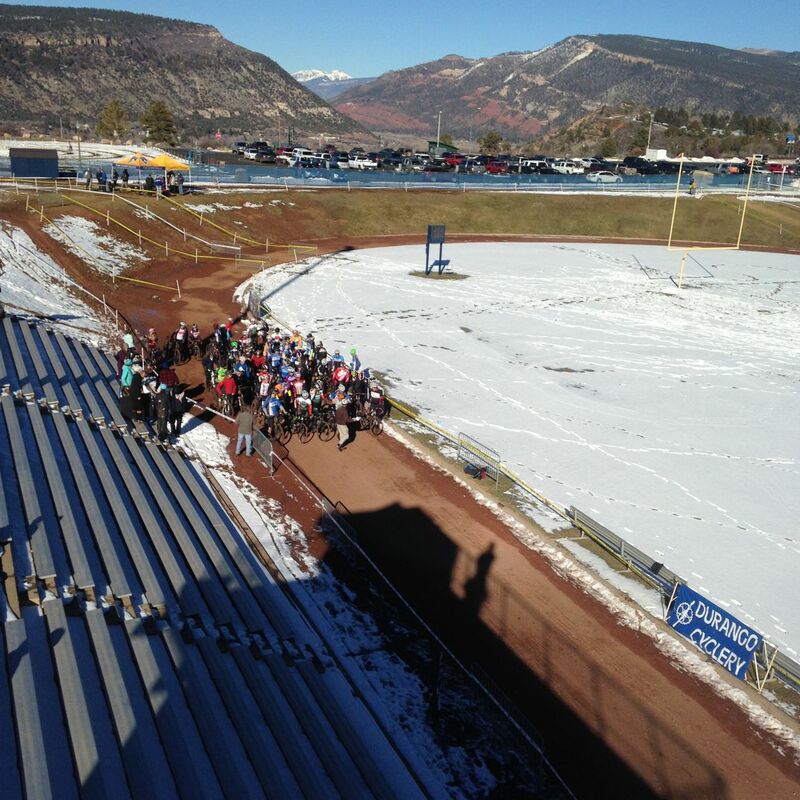 Come check out the racing action this Saturday at Fort Lewis College at 10 and 11am. 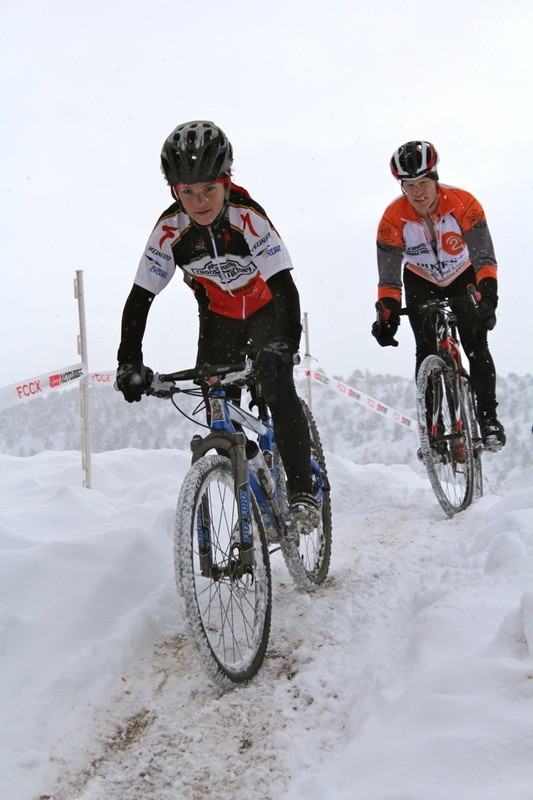 Yes, it will be chilly, but the cyclocross action should warm you right up. Will have coffee from Bread as well! This will be round 4 of the Durango Performance Center Cross Series and bound to be the fastest field yet with several local pros in town. It is a USA Cycling event so if you want to jump in, you’ll need an annual license or the option to buy a one day for 10 dollars. Either way, come on up and have a good time with our local cycling scene. For more information, check out the FLC Blog. Devo U14er Lucas Robbins racing cross last season at FLC. This year Devo will be one of the beneficiaries at the annual Red Ball Express Fundraiser put on by United Way and the Durango International Rotary Club. We will be selling tickets in front of Steaming Bean for Noel Night Friday, December 6th from 4 till 8. Please stop by and help support Devo. This fundraiser will be a great success if each family/athlete could sell 5 tickets. In addition to funding Devo, other non-profits and the United Way people who buy tickets have a chance to win $5,000, $2,000 and $1,000 at DMR Feb. 8th. 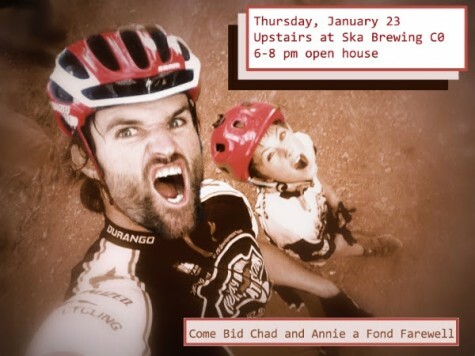 You can pick up tickets at Durango Cyclery during business hours from now until mid January. It would be great if anyone can pick up tickets for other Devo families since reaching people in the off-season can be difficult. Each ticket has a unique tracking number on it. When you sell a ticket, have the buyer fill out the right side of the ticket with name, contact information, etc (or you can fill it out for him/her). We need the contact information in order to identify the winner. Be sure to give the buyer the LEFT side of the ticket to keep. If we receive the wrong side of the ticket, it will not be entered into the contest. You should keep the RIGHT side of each ticket, and get them to Amy Haggart at the Devo office by Jan. 30th. If you do not return the stubs to us, those tickets will not be entered into the contest. All of the information on how to sell and fill out the Red Ball Tickets will come with the packet you will pick up. Copyright © 2013 Durango Devo, All rights reserved. 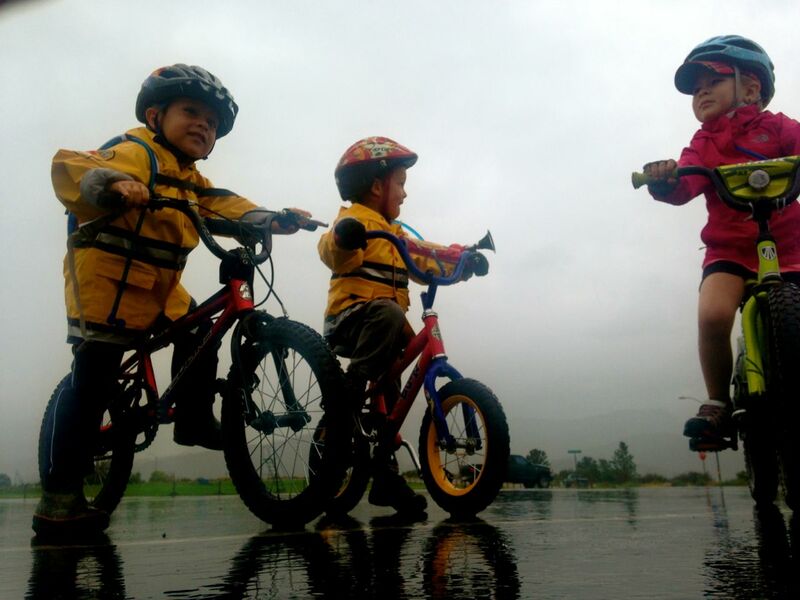 Registration for the 2014 Iron Horse Bicycle Classic opens TOMORROW, December 3, 2013, at 9:00 a.m. The event will be held Memorial Day Weekend, May 24-26, 2014. We have updated the website – ironhorsebicycleclassic.com – and we are excited to get things rolling for a great weekend of riding and racing in Durango. All the great events are back, (with a few changes): The Citizens Tour presented by McDonald’s, Durango to Silverton Road Race presented by Coca Cola, Quarter Horse to Purgatory, Sunday Downtown Events presented by Morehart-Murphy, East Animas Time Trial powered by BP, Cross Country Race presented by Mountain Bike Specialists, Kids Races fueled by SPRITE, and the Alpine Bank Push Bike Park. Whew, that’s a lot!! Highlights and changes for the 2014 event. Complete information can be found at the event website – please review the below and the website. Online registrations are provided by iamATHLETE – a great new partner for the event. A link to online registration is available through the event website. The Citizen’s Tour presented by McDonalds will be a timed event, again in 2014. 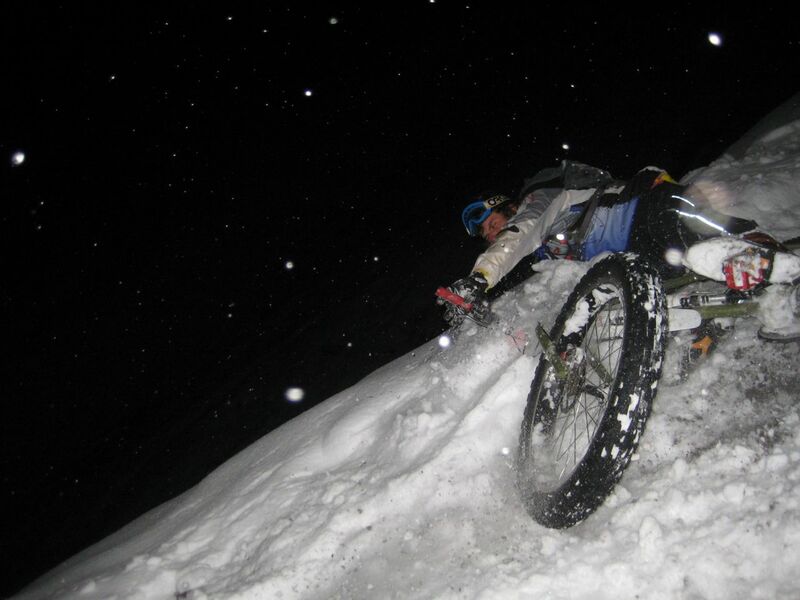 An increase in the field limit for 2014 – 2600 riders! NEW – Sunday’s Downtown Events presented by Morehart-Murphy include a few new activities – a Veteran Team Relay Challenge, a cyclocross criterium and the favorites – expanded Kids Races fueled by SPRITE and competitive crits for men and women, and the popular (and fun) the Cruzer Crit. For those climbers in the group – we have created the Mountain Horse Tour. You will start at Durango Mountain Resort @ 10:00 a.m. and finish in Silverton – this shortens the traditional ride – but is the hardest and most satisfying part! We have greatly expanded the commemorative official event merchandise for 2014, from riding gear to casual wear for men and women, we are also offering kids T’s with a cool new train logo. Stock up, we will ship it to you well in advance of the event. Again, registration opens tomorrow, December 3, 2013 at 9:00 a.m. Check out the website for complete details and register early and do not miss out on the fun in Durango! We hope to see you in 2014!